Indium Corporation is featuring its newly developed SAC105+Mn at NEPCON South China (Shenzhen), August 30-September 1, 2011. SAC105+Mn is the industry's first reliable, Pb-free, low-Ag alloy and has thermal cycling comparable to, and drop testing significantly better than, SAC305. Its thermal reliability characteristics are comparable to, and in some cases better than, standard high-cost, high-silver solder alloys. Additional attributes include: a drop shock reliability better than SAC105 for the hand held device market, a reduced environmental impact because it is lead-free, a manufacturing yield comparable to SAC305, and reduced silver content for decreased price volatility. SAC105+Mn is available in high volume to Chinese licensees. Visit us at NEPCON South China, booth #2F55. 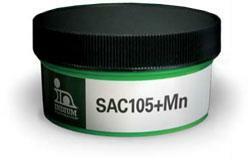 For more information about Indium Corporation's SAC105+Mn, email askus@indium.com.